Where Oh Where Is The U.S. Navy? sued the government for radiation poisoning. But that's only one American relic that's still floating around the world, after having been supposedly cleared of 'nuclear-contamination'. Where are all the other American floating systems of global-intimidation? 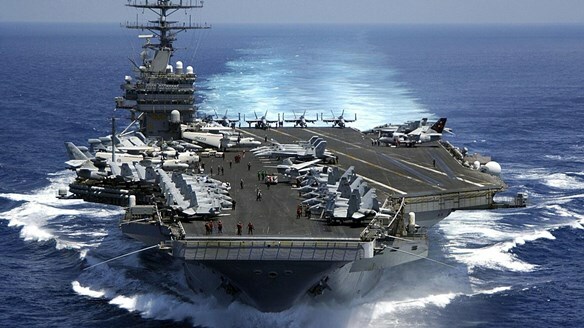 Just a few years back multiple Aircraft Carriers and U.S. Battle Groups were all over the Persian Gulf threatening to shut down everything and to attack Iran relentlessly. But as soon as Russia took over the defense of Crimea, the physical presence of American Aircraft Carriers began to become scarce in and around most of the disputed regions involving Russia. And as the world is now learning about the effectiveness of Russia's heavy weapons, both at sea and in the air: The US Aircraft Carriers seem to be staying completely out-of-the-way of any area where Russian forces might be actively deployed. Why is that? Yet he's in charge of the U.S. War Department? Just for the hell of it I checked with Google and this is some of what I found. This is 2015, WWII requirements are not operative any longer. in potential confrontations with Russia or China? 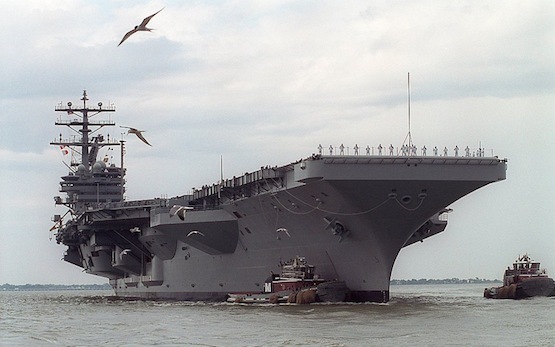 “Several years ago, Congress waived the 11-carrier requirement. As a result, the Navy currently operates ten aircraft carriers until the USS Gerald R. Ford (CVN 78) joins the fleet in 2016. But one is in constant maintenance at all times and unavailable for global deployment. Congress must now decide if America’s single-digit carrier fleet is enough to meet the global demands of a superpower. The short answer is no. Perhaps we need to meet this pride and arrogance with some understanding in view of the numerical superiority of the U.S. Navy. In total, it currently has 10 operational aircraft carriers (two in reserve), while Russia and China have only one each. Aircraft carriers are the great pride of the U.S. Navy and are also perfect to underline visually the claim of the ruler of the seas. They are therefore well liked by U.S. presidents as stages for delivering speeches when the time comes to tell the people that this unique nation has once again won a heroic victory. I'm certainly not a military expert of any kind. In the late 1950's I was a lowly aircraft controller, assisting officers with air to air intercepts during one of those rare moments when America was not bombing the hell out of the world, based on the non-stop lies that kept pouring out of the Pentagon, after my tour of duty ended in1963, just before Kennedy was murdered. But I submit that it doesn't take a genius to figure out that if America is reluctant to commit it's heaviest military weapons to the current battle zones of the world, there must be more reasons than just budget considerations at issue. Kirwan: Joe, the author of the link, was US Naval Intelligence, and he was one of our best sources in this war for the truth: He was poisoned at home and paid with his life to get information about the realities to the US public - and while it's been years since he died, we need to listen to what he uncovered for the public to know, both then and now. Consequently, it would appear that the Pentagon and the Department of the Navy just might be reviewing how 'America' will proceed given the real-time current threat to our supposedly unbeatable military forces in the current clash over protecting Syria and now possibly Iran and Iraq as well: From America and Israeli warmongers? It's way past time that the totally corrupted Pentagon and the failed USSA government began to level with the public ­ because 'Amerika' is not half the global-bully that they are presenting “us” as. In fact to send troops in based on the kinds of massively incorrect military capabilities could constitute a kind of war crime in itself, because the US military is nothing like as “powerful” as the US puppets are telling the troops they are. Maybe this could be seen as yet another reason for the military to take over this government to finally put an end to all these global lies in the United States once and for all?